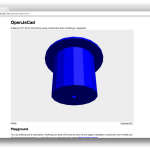 OpenJsCad is another entry in the “model as programing problem” category. OpenJsCad has more flexibility than OpenSCAD but is currently way less pleasant to use. OpenJsCad embraces dynamic variables. Even the shapes are variables. OpenSCAD has variables that behave more like glorified constants. 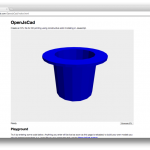 OpenJsCad entered the arena more recently (January 2012) and needs to resolve some interface problems. So while I think in the long run OpenJsCad might prove to be more powerful I didn’t enjoy using it as much. OpenJsCad is the only software I’ve tried that bridges both worlds in terms of where you interact with it. 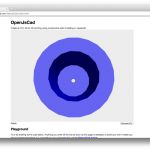 If installing software locally is not an option, that’s okay – just go to the OpenJsCad home page and use it there. If you want to work offline, downloading the code is an option. I’m not clear on why but the code does not live in the master branch on github. To get the actual source I had to go the the gh-pages branch and download the zip (rather than just clone the repository). After the unpacking the archive file I pointed Chrome to the index.html file included and everything worked perfectly. Not quite as brain-dead easy as downloading an executable, but it would be possible to create models while lounging on a beautiful deserted island. I did all my actual typing in BBEdit since the code window is small and “below the fold” when working on a laptop. I did not like that I couldn’t see the code, model and status messages all at the same time.